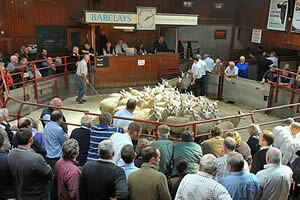 The Cumberland & Dumfriesshire Farmers Mart had forward 5,389 Store Lambs and Breeding Sheep at their Weekly Sale at Longtown on Tuesday 22nd November, 2011. Store lambs the dearest so far with many Welsh buyers present. Top of £85.50 for Beltex from The Park; Texel £84.50, £81.50 Ridley Stokoe, £77.50 Gibbs Hill; Charollais £83.50, £76.50 The Heugh, £70.50 Minto Kames; Greyface £76.50 Gibbs Hill, £75.50 Hightown, £75 Wydon Eals; Half Bred £76 Earlside; Suffolk £75.50 Horseholme and Borthwick Brae, £75 Rise Head, £73.50 Minto Kames; Cheviot Mules £74.50 Castlefairn, £72 Routin Lynn; North Country Cheviot £71.50 Earlside; Romney Marsh £71.50 Rammerscales; Lleyn £71 Chipknowe; Blackface £62.50 Gibbs Hill, £60.50 Horseholme, £59.50 Bowan Hill and Ramshope; Swaledale £53.50 East Stobbylea, £50.50 Pryhill. The 958 Hill Cheviots were extremely dear to a top of £68.50 Attonburn, £66.50 Winterhope and Ramshope, £65.50 Carlenrigg, £62.50 Girnwood. Cast ewes to £94 South Mains, hill types £61.50 Bayles. Cast rams to £65 Ramshope. Breeding sheep proved very good to sell and short of requirements. Top of £92 for Greyface ewe lambs from Far Skelgill, others £80 Gibbs Hill, £78 High Nook; Texel £80.50 Sherracraig; Suffolk £70.50 High Nook; Blackface £64 The Glen. Also included was a dispersal of Herdwick sheep from Mr P. Fowler, Borrobol Farm, Kimbrace, Sutherland which sold very well, top of £74 for stock rams, tup lambs to £63, gimmers to £69 and £68, correct ewes to £60 and ewe lambs to £48.